How will the water levels be mid April - May 1 and launch access? Want to try this area for a few weekends. Thanks for the insight. All of the kings we got on long coppers and wire dipsys we picked off bottom and they were hogs. Our biggest for the week was 25 pounds and 36.5 inches. Broke a number off that size as well. 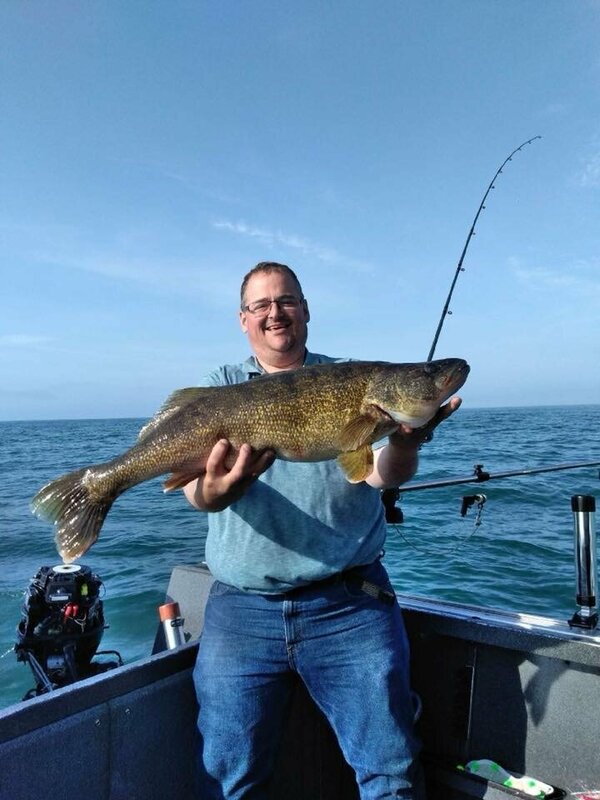 Our biggest laker was 36" and 19 pounds. Not bad for never catching a king before. We fish Champlain and George. Maybe I should be asking what part of the upper water column I should be working. I saw lots of surfacing fish offshore and felt like I was missing out. Tried flatling a few sticks off the boards over the deep water that didn't produce. Inshore we did well with sticks off boards and spoons off riggers for the browns & coho. hairbone replied to piratesholly's topic in Questions About Trout & Salmon Trolling? You post some great info! Headed out in which weeks for our 2st time are rge bar. Spoon Colors Niagra Bar Spring Headed out to the bar for the first time in a month and would like to know what color program we should be using. Sad, Liked that store & location Always went there when in the area. Nope! Lol. Love that boat!! Great Rig. Would be running to Rochester to buy it if I didn't already own a 20' Alumaweld. Posted the add link on the Champlain fishing forum for you. Per the blood run pro tips, how much leader to the spin & glow from copper? Tried out 300 of 60 pound and am definitely getting good bottom contact. Was running a bead chain at 5' in front of spin n glo and it was picking up debris. Started running the spin n glo set up direct on my 40' leader and it is working better. I put the 60 pound on a spare reel for safe keeping and opted to put 400' of 45 lb on for my next. Did have an interting thing happy. My other copper rod snagged my mining Rod and I ended up holding the spin n glo in my hand and having 300' out in a big u. I said what the heck and tossed the spin n gl I and when it got 50' fronm the boat down she went and 10 seconds latter Åºzzzzzz... laker on. Figured I would end up with a mess of line. How long do you need to soak in scent prior to using? Opened one up for the first time and it smells like the rubber boot isle at any discount department store. Did try mining this past weekend on my 300 32lb blood run. End up adding a torpedo weight pulling a spoon and ended up getting a few in the 80-90 foot range. Last year I ran 540' of 45 lb copper that I used years ago for jerking copper with gteat success.. I want to know where I can buy the 60 lb copper in 450' and what reel I would use. I see the dive chart listed under blood run, but not for sale. I am primarily looking for a july, August, September setup on my home waters targeting 100-130 range. NOW THAT IS SOME FUNNY CHIT! I was fortunate to water test my old boat with the marine mechanic when I repowered. We ended up changing mounting holes as we had planning issues and there was lots of torque on thg e wheel. I bet your listing is caused by torque from the wrong height and you can not sense it because of the hydraulic steering. As far as your top speed you are getting robbed. I have 700 ponds more weight on a 20' plate aluminum hull, 18 deg,kicker,rocket launcher all the bells and whistles pushed by a 175 opti max with five guys at 42 mph on a good day. I bought a fully rigged 09 alumaweld intruder from this site last year. Being fully rigged with pro kicker & TRL1 all I had to due is add my electronics, downrigger weights and tackle and I was fishing. Use the site search tempest and be ready to run with money in hand to get what you want. Number of lines per person? hairbone replied to SmellsLikeFishNH's topic in Questions About Trout & Salmon Trolling? hairbone replied to tj13825's topic in Questions About Trout & Salmon Trolling? What knot are you using for braid to wire? Great looking rig! I bought an 09 alumaweld intruder off LOU classifieds last year and couldn't be happier.